In my never-ending quest to find my perfect desk setup I've "invested" in another monitor. Bringing the current total to three. The right-most 24" monitor being connected to my laptop and the main work area. The other two 22" monitors are connected to the Mac Minis. One for messing about on/testing/iTunes and one to run servers inside Parallels. The two Minis used to share a monitor via a KVM switch but I got fed up with switching all the time just to see the Domino server console messages (am I the only one who still debugs web apps using Msgbox?!). Now they just share the keyboard and mouse. As important as the time-saving aspect of not having to switch between monitors all the time is the fact it looks cool. If I could get away with it I'd have a whole bank of them. Stockbroker-styley. Ideally some of them would have line charts on them (maybe just pseudo-data, but it would look cool). Surely there's no such thing as too many monitors. Is there such a thing as a perfect setup for a desk? What's mine missing? Thanks to Palmi I've extended the number of screens by one. For free! Anybody fancy a game of spot the difference between the two photos? Actually, I'd thought about going dual monitor on the laptop. But, if I put it on a stand won't that just show me the same thing on the laptop as the main screen? Or can I merge the two screens? Ignore that. Just tried and out and, like you say, you can extend from to other. This became SOP for me about three years ago... would rather not do without now. Get yourself a copy of UltraMon and have both screens work independently. I use dual monitors with my laptop though dont use the built in laptop screnn, I use a docking station and the two monitors are plugged into that, I extend the desktop across the two screens. Great for having two remote sessions open, or a browser and a document at the same time. two open two screens using your laptop screen there is usally an option like Fn F5 to switch between same display or extended display. Ignore above you found out before I posted and should have proof read it before posting. At home I have a multi-monitor setup too. Large primary 1920x1200 on my main desktop. Secondary monitor (also on main machine - 2nd graphics card) set as 1024x1680 in portrait mode (ideal for reading webpages such as Codestore). 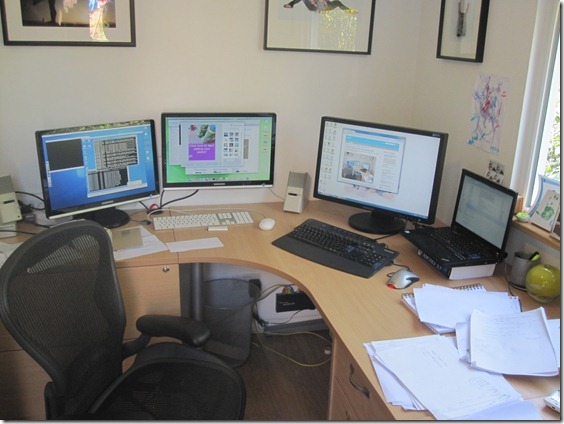 I have a laptop (1920x1200) to the left hand side of the main monitors, above I have two 1024x768 displays. One of which is an Unbuntu file server, with a Netvibes dashboard display for news feeds and useful info, the other is a Mac Mini - acquired from you many moons ago - which is my media player box. All of these are slaved together by Synergy from the main system. So no KVM needed and a single mouse/keyboard for all four machines. Wife has a single large monitor (1400x968) and a second machine (also Synergy linked) with two 1024x768 displays for her Day Trading setup. You can never have too many monitors. After all it's only the complete megalomaniacs who get to take over the world and run their evil empires from command bunkers with loads of screens and a big red button. So you use five screens? Nice. I'm already thinking I could squeeze one above the screen in the centre by attaching it to the wall. Or even move the one of the right above the middle one to save me craning my neck to see the servers. I have a great step towards the perfect desktop for you. Its called Synergy (http://synergy2.sourceforge.net/). You load it on all your machines, with the main machine acting as a server. You then tell it where all your machines are in relation to each other. Once setup you no longer need a KVM. If you scroll off the screen left it goes to that machine. If you keep scrolling it goes onto the next one. No physical connection, it uses IP. It's awesome open source and free. Dang I did not see Dragon has already commented on Synergy. Oh I forgot to mention also. Get a slingbox, throw the player on one of your mac minis and watch TV while doing mindless tasks during the day. Second Dragon on the "never enough screens point". My machine is a Mac Pro with two 23' screens. 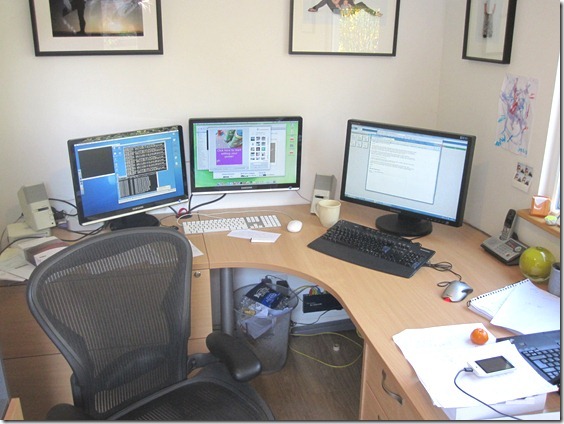 I am now lusting about the idea of bringing another screen to the two existing ones. My mac has 13gig of memory, so I run all my servers in separate virtual machines (generally, just the one server). I use Spaces and Warp to switch between "pc-world" and "mac-world". No KVM. One goodie which my ergonomics manager (me) got me to buy was one of those electrically driven height-adjustable tables. This has proven to be good to change posture and get a new take on things. Wanted an Aero (is that one I see next to your desk?) but the table sucked all the cash for that year, so I'm stuck on an IKEA Bimbo or whatever the name is of their cheapest chairs. Is the Aero any good, by the way? The chair is brilliant! Would definitely recommend and would hate to change to anything else. Mine was 2nd hand of ebay and half retail price. I felt really good about my dual 22's connect to my laptop via the docking station. Now I sit broken hearted :( dreaming of Dragon's setup. Its the same feeling as in the gym when you get your max weight but miss 10 lbs heavier. You really want to be happy but can't be because you missed the weight you tried. Oh well, no more crying today. Have a good one everybody! I run a desktop with (on the right) dual 22's (1680 x 1050), a laptop (on the left) with it's monitor (1280 x 800) and an external 22" widescreen (1920 x 1080) and in between these I have a 19" monitor for my server. I use synergy to connect all 5 monitors to one keyboard and mouse. Do not forget to use UltraMon to allow the multiple screens on each system to act independently. Now if I could figure out how to run 360Desktop across all 5 monitors, I would be in heaven. Every time I see pictures of your office I'm jealous! It looks like such a great place to sit and work every day. Now with more monitors! More monitors is good. Wow, get yourself a flight controller, some pedals, and you're ready for an awesome FlightSim session. A difference? Yes you are the orange ;-). Did I get this right? Are you running the Domino server inside Parallels?